"This curriculum is challenging but fun." The 638 page teacher's manual includes the detailed lesson plans for all subject areas and the required student workbook pages. Bound in a sturdy three-ring binder so the pages are easily removable for daily use. Functions as a portfolio of your child’s work. "Takes full advantage of a unit study approach to learning!" The 672 page teacher's manual includes the detailed lesson plans for all subject areas and the required student workbook pages. Bound in a sturdy three-ring binder so the pages are easily removable for daily use. Functions as a portfolio of your child’s work. 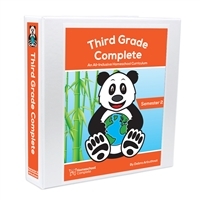 The 262 page workbook is designed for each additional child using the Third Grade Complete curriculum. The 270 page workbook is designed for each additional child using the Third Grade Complete curriculum. The 638 page teacher's manual includes the detailed lesson plans for all subject areas and the required student workbook pages. The 672 page teacher's manual includes the detailed lesson plans for all subject areas and the required student workbook pages.